This is Maz from Wilkesbacka. He is by the superstallion *Aladdinn and out of *Maricedia. Among others, he is the sire of Errata. Maz belongs to the dam line of Sahara OA imp 1845 to Jarczowce. The strain is Kuhailan and the only direct line from Sahara OA is that from her daughter Sahara Slepka OA who was foaled in transit. Many members of this family perished in World War I and only two mares were saved, Pomponia 1902 and her daughter by Kohejlan OA, Zulejma 1914. After the war Pomponia had two more daughters, Dora 1922 by Bakszysz and Bona 1920 by Mazepa I. Of the postwar daughters, only Dora had any impact on the breed. Dora 1922 was the dam of the stallion Omar II by Hardy and his full sister *Nora, imported to USA by J.M Dickinson. The most important of her produce however was the mare Krucica 1929 by Farys II. She was the dam of a little filly that managed to survive the walk to Tersk by her dam's side. This little filly, Mammona, was perhaps the best horse ever added to the russian breeding program which is really no surprise when you look at her pedigree. She was by Ofir and thus a sister to the famous "W" stallions and on her mothers side she had two lines to the strong Sahara OA line and her sire added another since his dam was a granddaughter of Pomponia 1902. Mammona 1939 entered the breeding program at Tersk as soon as it was possible as a four-year old and had the mare Nomenklatura by Naseem. She gave birth to a total of 18 foals, 12 stallions and 6 mares. Five of the mares were used and one of the stallions, Pomeranets by Priboj. Her daughter Monopolia 1956 by Priboj was the dam of *Maritsa by Arax imp Sweden. 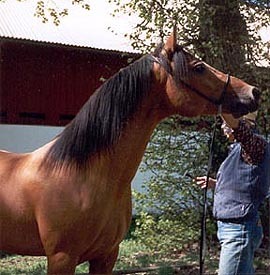 Monopolia was also the dam of *Monogramma by Knippel, the dam of the stallion Mamluk imp Sweden. *Maritsa was the dam four stallions and four mares. The sons were Madar by Dardir, Pomar by Pohaniec, *Maligg and *RD Misha, both by Algier. Her daughter *Maricedia by *Cedr was dam of the stallions Maz and Mazur and the mares Marzenie, *Mazurka, Marinka and *Makrela.